The scene of the incident, which took place near a store and cafe on routes 30 and 30A in Schoharie County. Killing 20 people. Twenty people have been killed in a crash involving a SUV stretch limousine taking people to a party in the US state of New York. The limousine was carrying several couples to a birthday party failed to stop at an intersection in upstate New York and struck a parked vehicle, killing 20 people in the deadliest transportation accident in the United States in almost 10 years. 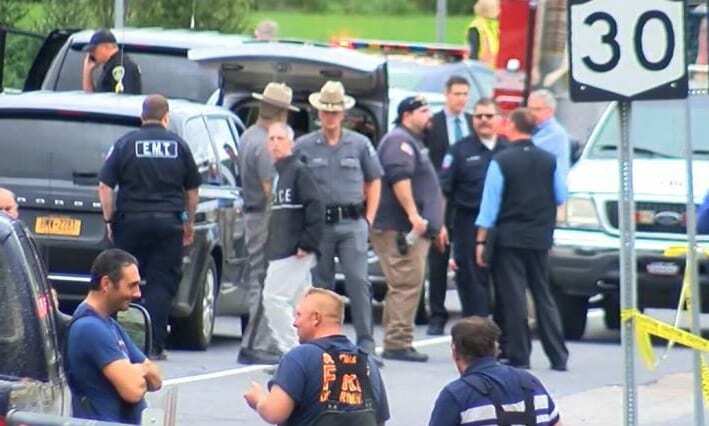 All 18 people in the limousine died along with two pedestrians in the incident on Saturday afternoon in the town of Schoharie, New York as police confirmed. The limo was travelling southwest on State Route 30 when it didn’t stop at the intersection with State Route 30 A and collided with an SUV in the parking lot shortly before 2 p.m. Saturday in Schoharie. The incident, which took place near a store and cafe on routes 30 and 30A in Schoharie County. Witnesses described the horror of seeing the SUV-style limousine shoot across a junction, hit another car, and then plough into people in a shop car park, killing two pedestrians near the unoccupied, parked 2015 Toyota Highlander. Authorities are still notifying the families of victims and declined to release the victims and are unable to answer several questions at this point, such as if the limo’s occupants were wearing seatbelts, whether the vehicle’s brakes were working or whether the driver was speeding. The speed limit at the intersection is 50 mph. The crash happened outside an Apple Barrel Country Store & Cafe. Nearby residents describe the crash was loud enough to be heard from down the road. The investigation was still in its early stages, adding that several separate police units were involved, including an identification unit and a drone team. The National Transportation Safety Board said that it was also sending a team of investigators to the site of the crash. Who are expected to investigate at the scene for at least five days.